Today [17/05/2017] Local Trust is launching Empowered Communities in the 2020s, a research and public engagement project inviting organisations, public services, community groups, organisers and individual citizens to share their visions of how communities can become more empowered and vibrant. Local Trust is providing a range of ways to participate, in person, online and on social media at www.localtrust.knightstudiosdevelopment.com/empowered2020s and hashtag #Empowered2020s. “We need people to feel a stake in what’s happening beyond their front doors.” Tony Armstrong, member of the Empowered Communities project steering group. “It’s important for people to be proud of where they live and to feel like they have a future there.” Daniel Goodwin, member of the Empowered Communities project steering group. 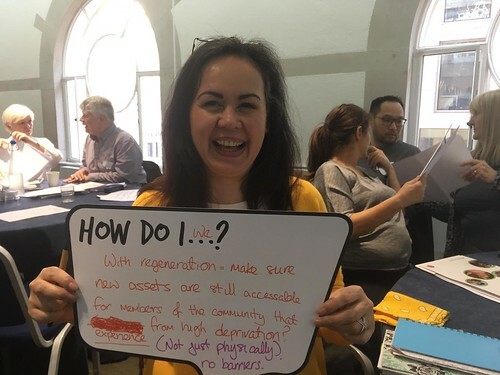 “Are empowered individuals and communities those who create together as well as do things together?” Lorna Prescott, member of the Empowered Communities project steering group. “People need to feel safe and respected in their community, and feel that they know where to get help and that other people will help them” said Dr Rachel Shanks, member of the Empowered Communities project steering group.